Happy Cinco De Mayo! 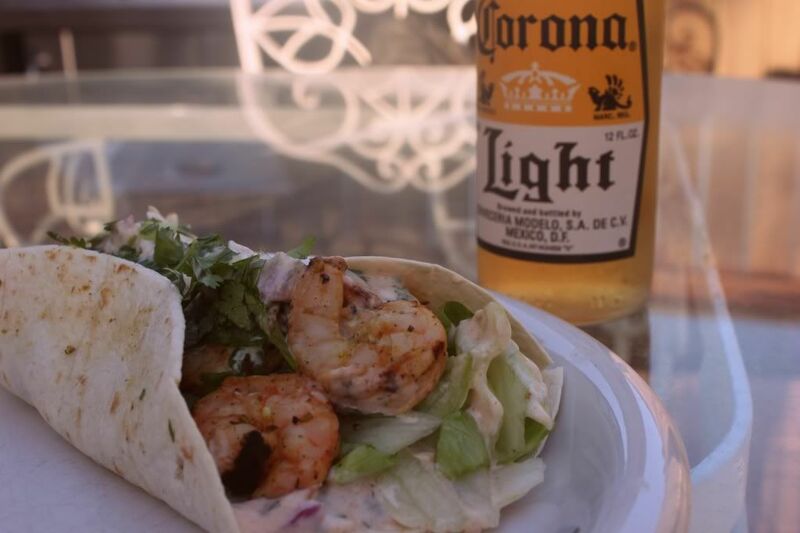 Even though I am not of Mexican heritage I love just about any excuse to make a delicious Mexican meal...and drink a Corona of course ;) Tonight I made low carb citrus shrimp tacos...Ian had 5 so I can officially say they were a hit! a dash a salt..then a few more..
1) Combine the lime juice, lemon juice, garlic, onion and Mexican seasoning in a bowl. Add shrimp and coat with the marinade. 2) Preheat grill to 400 degrees. 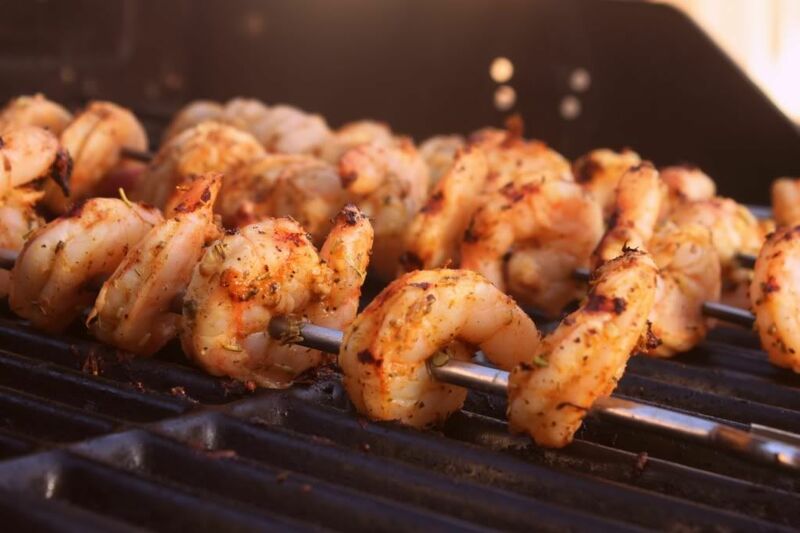 Place shrimp on the skewers and place on the grill. We like our shrimp extra crispy so I grilled them for about 10 min total. 4)Spread a good amount of the cream sauce on the bottom of the tortilla (which I also warmed up on the BBQ) and place 5-6 shrimp on each tortilla. 5) Add a dollop ( I like that word) more of the sauce on top of the shrimp. Add sliced iceberg lettuce and garnish with the cilantro! NEVER ever turn the skewers with your bare hands (HELLO)....because when the grill is turned up to 400 degrees this is HOT....I have two lovely little burn blisters to remind me I should never do this again. OMG these look delicious! I must book mark this and try :) Thanks for sharing!! Yum! I have some gulf shrimp in the freezer just waiting to be used. I'm trying this recipe out this weekend! This looks so yummy! Following from the Boost hop! Hope you have a great Friday and Stop by and see me! Love Mexican food! I made chalupa's last night and no one got it that it was for cinco de mayo. Geesh! Guess what? You have word verification! Thanks for the follow! Following you back now. THose shrimp look so yummy...I shouldn't have looked right now before lunch! Oooooh, these look amazing! And that's really saying something because I'm not crazy about shrimp ;-) Definitely going to give this a try--thanks for the recipe! Thanks so much for your sweet comment and following my blog! Yummy! We too had fish tacos for Cinco De Mayo but ours were not shrimp..They look so good. well Ian is part Mexican, so it's OK looks like your becoming the little cook.. Thanks so much for stopping by my site and leaving such wonderful comments! I hope you come back again! The food looks yummy! Yum! I love me some shrimp tacos. I'm definately marking down this recipe. Oh boy those shrimp look pretty incredible! Can't wait to try this! those look amazing!!! we really don't eat meat and on occasion we do eat fish..so this meal is PERFECT!!!! im not sure how i missed this post!!! those look amazing! These look really yummy! I recently became a fan of grilled fish tacos - I've never been a seafood fan, but I'm trying. I'm type 2, controlled only with diet, so I'd load all this up on a couple lettuce leaves. Yum! Ummm what size "tub" of sour cream am I supposed to be using? That's pretty non-descript. These were delish! FYI - I used fat free sour cream and made my own 'mexican' seasoning (since I didn't have a packet handy). It was very easy with some spices you probably already have in your drawer and won't have to deal with the super high sodium levels! :) (cilantro, chili powder, ground cumin, salt, pepper, oregano, dash of cinnamon, paprika). Definitely a great recipe!